To hear the words in this book read by a native speaker, choose a page number then click on the arrow buttons. To go to the recommended websites for this book, click on the links below. A few of the Japanese words have been updated for the most recent edition of this book, and may be different from those in your copy. The words in Quicklinks are the words most commonly used in Japan today. For links to more language activities and resources, click on / Japanese / in the menu at the top of this page. To hear Japanese phrases click on "Language" under Learn in the left menu. Click on "About the project" once the webpage loads, select "Contents" and choose a topic, or to hear simple phrases, click on "Classroom Japanese". 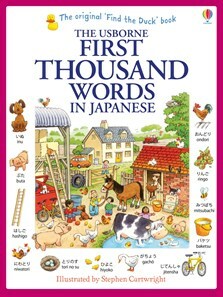 A classic bilingual English/Japanese word book illustrated with busy scenes and labelled pictures to help children learn key Japanese vocabulary. Next to each picture, the Japanese word is written in kana, the Japanese syllabic signs often used for beginners, along with a transliteration in Roman letters. Includes a short introduction to kana with a simple pronunciation guide and an English/Japanese list of all the words in the book. Readers can hear how to pronounce all the words by listening to a native speaker on the Usborne Quicklinks website.